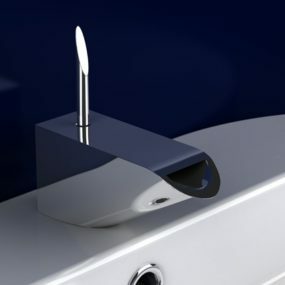 There are design solutions that work anywhere every time. White color scheme, for example, works perfectly for any room and with any style and decor. Natural wood fits any decor. 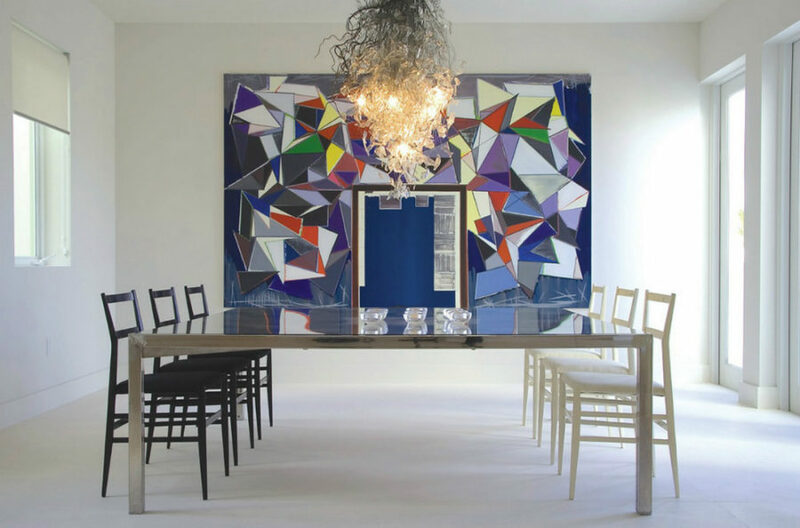 Similarly, a big statement artwork makes for a perfect dining room design solution. It’s simple yet elegant, regardless of room’s style or what that artwork depicts. 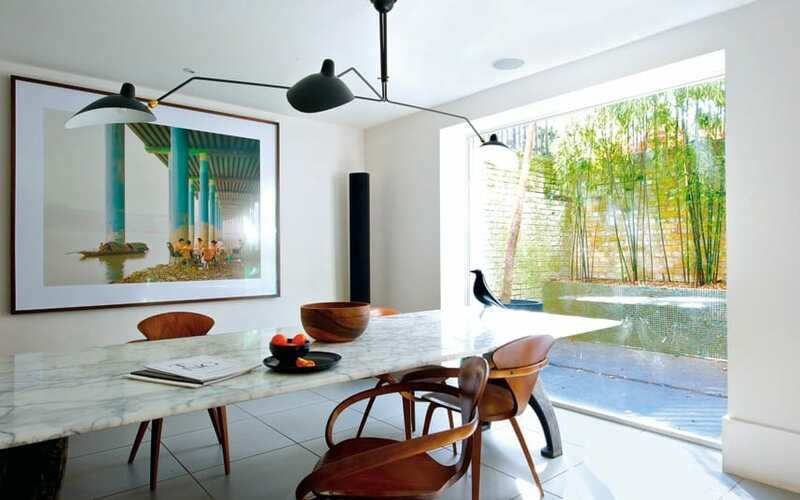 Dining rooms featuring artworks always look well-designed and stylish, if not luxe. Not an art expert? 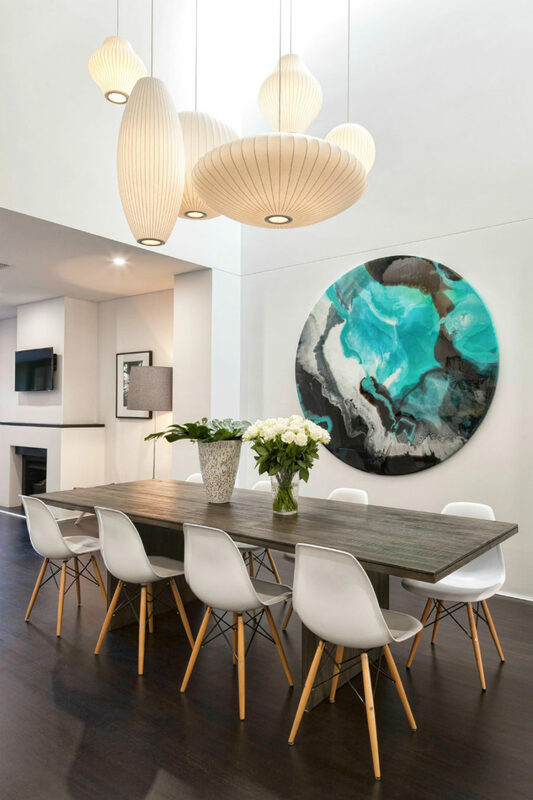 Opt for contemporary abstract works that accent your color scheme or choose the one from which you can pick a color palette for your dining room. This is the easiest way to decorate. 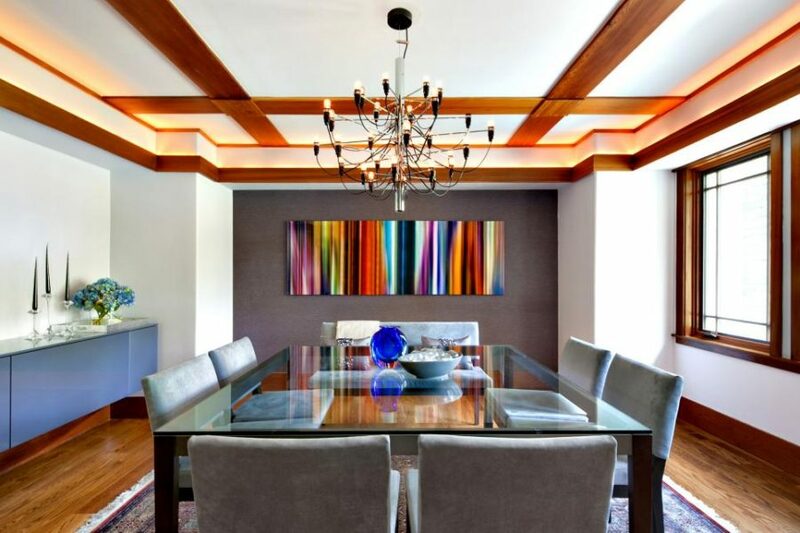 Dining rooms featuring artworks in abstract style often appear ultra contemporary. 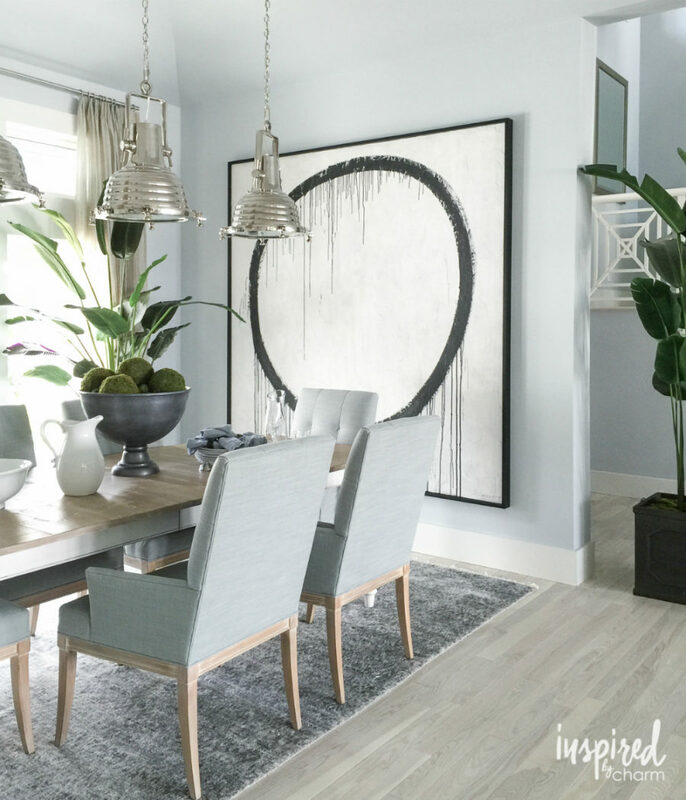 A simple arrangement of a dining set, a lighting fixture, and an artwork is all you really need in order to create an alluring, spread-worthy dining area. They may vary greatly in style, materials, quality, and even shapes, but that grouping is central to making a complete zone that feels like an entirely separate room. If your artwork is big enough, you don’t even need to hang it. The latest trends offer leaning wall art against walls for a contemporary, informal look. The lower your ceilings, the smaller the artwork you can choose, but it always needs to add something to the bigger picture. 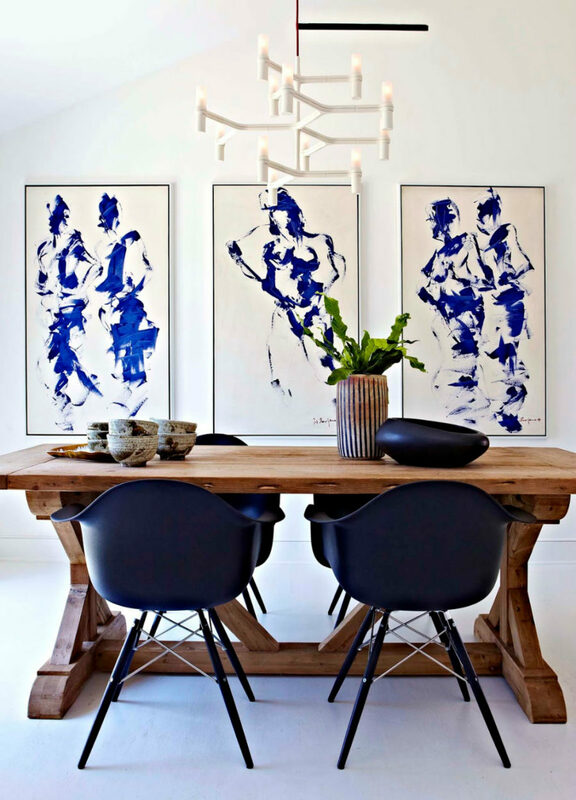 Dining rooms featuring artworks that lean against walls look even more contemporary and cool. 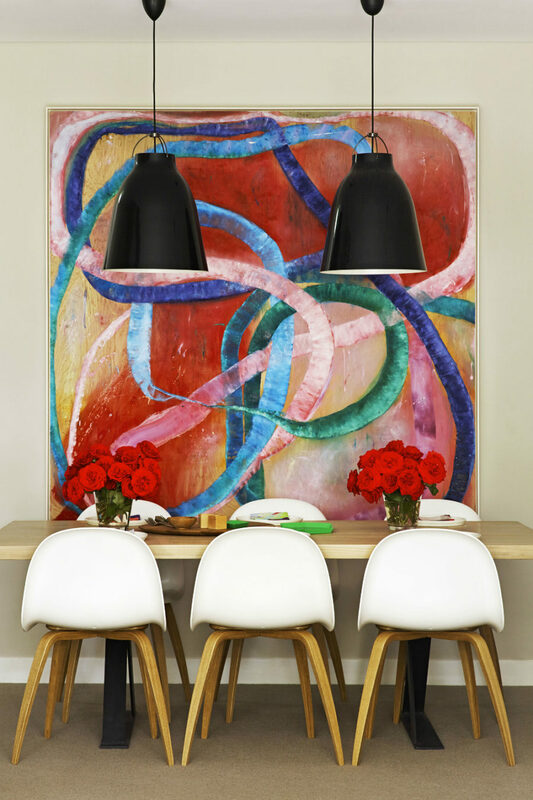 An abstract painting doesn’t have to be all colors of the rainbow, however. It can complement an existing neutral color scheme with muted tones of its own. 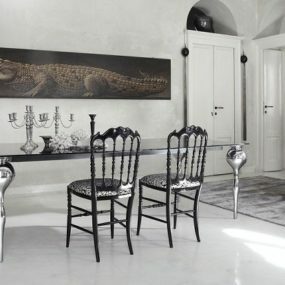 Many home decor stores offer contemporary art that will easily go with most modern dining room designs. 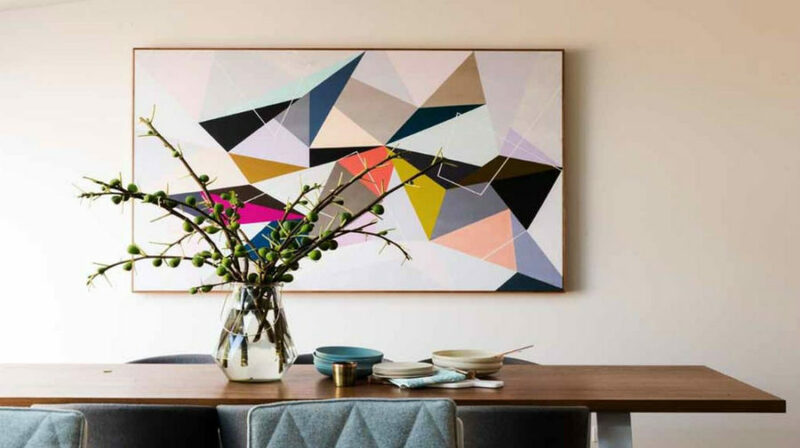 When you want to bring a bit more dynamic to your neutral dining room, an artwork full of geometric shapes is in order. 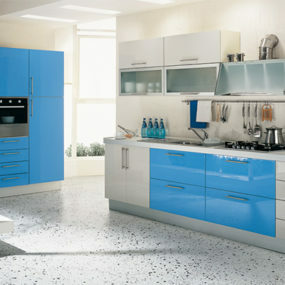 It will instantly make your contemporary modern eatery look stylish and lively. Colorful abstract geometric artworks work just as well as minimalist graphic ones. They just bring another type of dynamic to the interior. The latter work well with calmer color schemes and simpler furnishings, while the former allow for more detail and accessorizing. Big statement works are great for separate rooms. Dining areas require something a bit more restrained, at least in size. 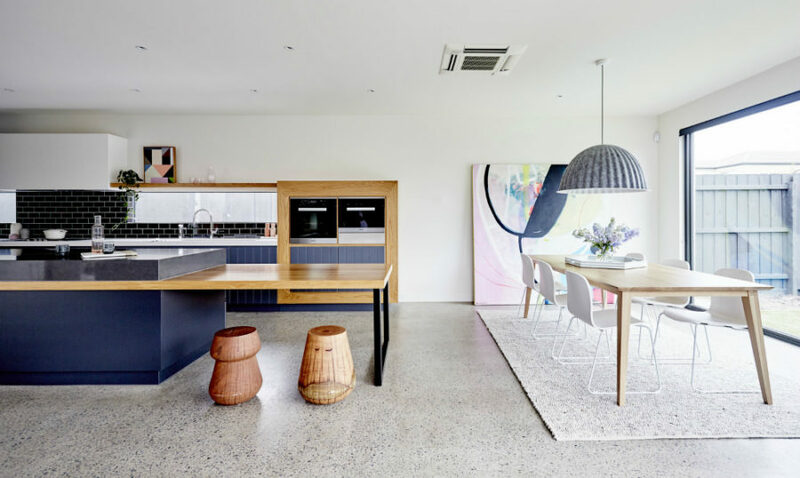 Minimal artworks can also be used to punctuate contemporary interior style, especially if it uses a lot of clean lines and understated furnishings. Bright artworks will always stand out most of all. 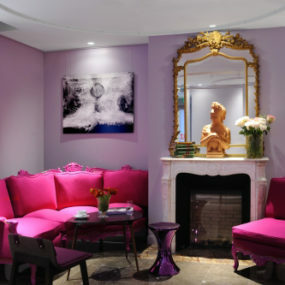 And you can use them in a room where a lot of different colors and textures converge. It doesn’t matter what you use – digital prints, pop art, or paintings. Brights make the best accents. 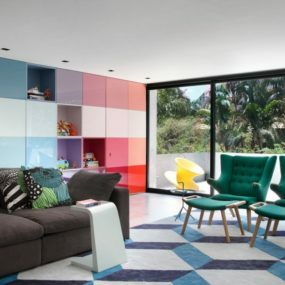 Pop art is a great option for a contemporary home, as it makes for a much starker contrast with the minimal furnishings and clean aesthetics of the style. 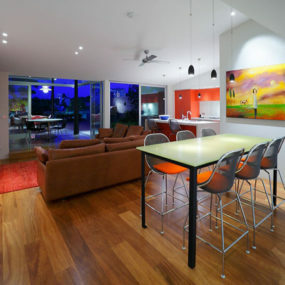 Another perk of pop art is that you can equally easily incorporate it into a bright or neutral interior. 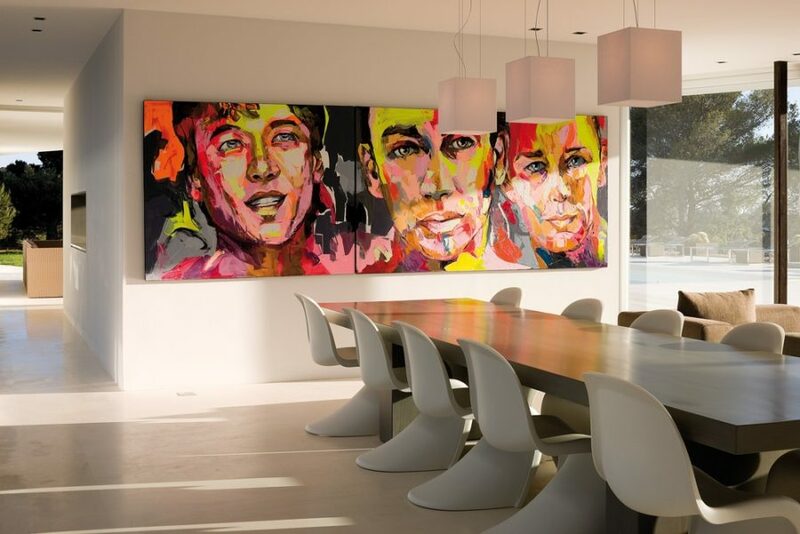 Dining rooms featuring artworks in pop art style are most exciting. Digital prints and paintings are just as effective in producing that contrast. But they come in a vast variety of different styles. There’s abstract art, posters, prints, and all kinds of visuals you can choose from. The only rule is that they go well with your decor. Photography is a more contemporary wall art. 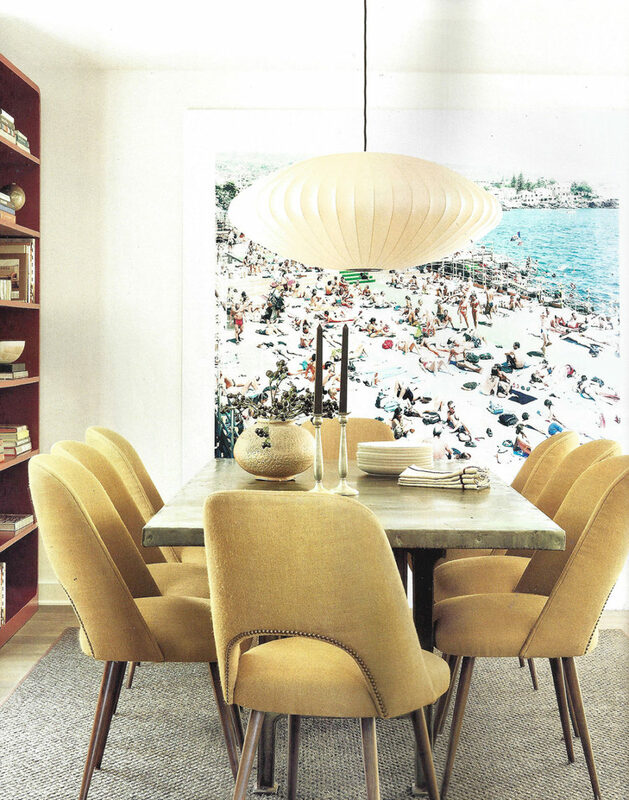 Framed pictures, whether iconic or the ones you’ve done yourself, can always find a place in a modern dining room. It’s all a matter of what atmosphere you want to create for the place where you’ll be receiving guests and eating day in and out. Iconic photographs have a way of creating a gallery type of atmosphere. But they also tell a story of a certain place or people. Fashion portraits make for a stylish look. And you don’t even have to use more than one of those to create the area that instantly captures attention. Photos of nature can look really different, some creating a feel of beckoning, while others appearing as if they were painted. 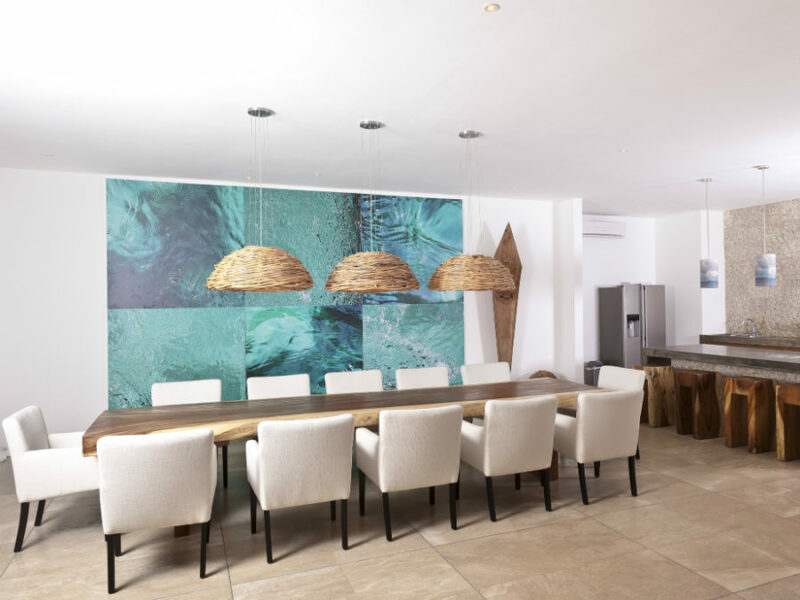 Photography can be devoid of color, and still paint a full picture of what it wants to show, so don’t discount it, when choosing wall art for your dining area. 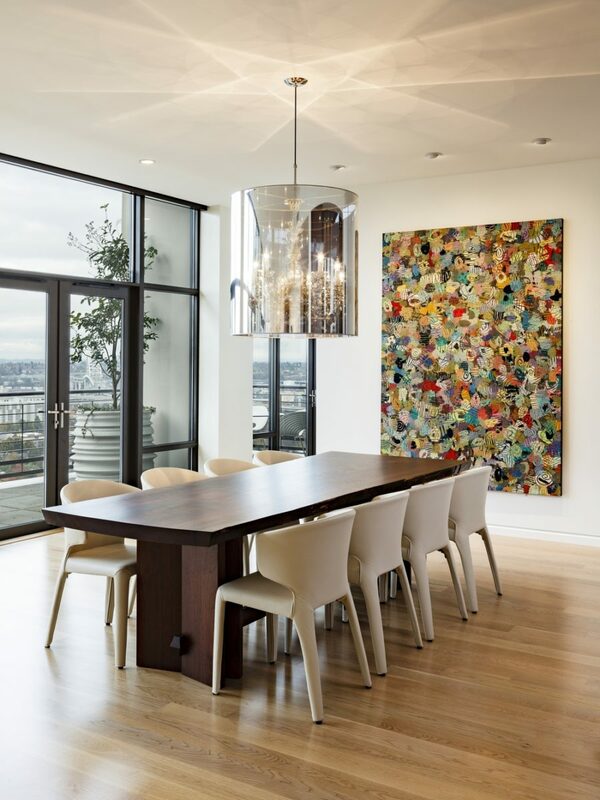 Dining rooms featuring artworks themed in nature often have a livelier feel to them. But nature can appear in different shapes and forms in art. And the following are only a few cool ideas that we could find in the great wide web. An artwork doesn’t have to hang on a wall. It can be a part of it. Artistic murals have long been a thing that homeowners considered for their dwellings. It also doesn’t have to come in the familiar rectangular or square form. Take note of the Earth marble artwork from the dining room by Create Expectations. How much more effective does it look without a white framed square around it? Who doesn’t stop at the sight of cute cartoon-ish animals? Even if to simply disregard them as ‘unrealistic’. 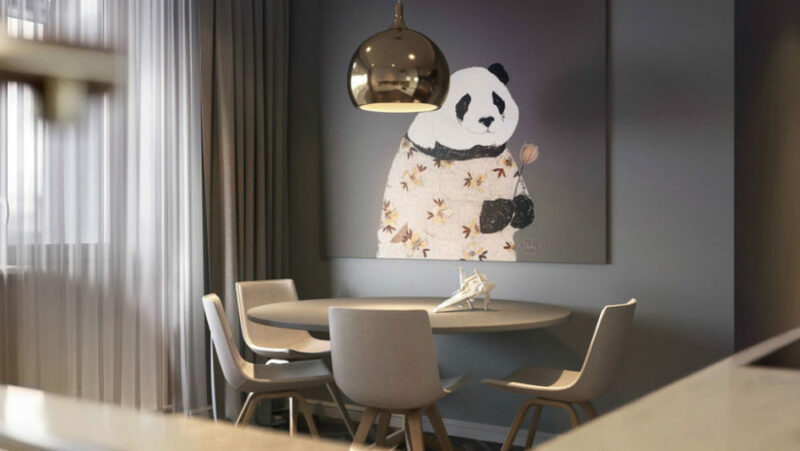 Note how simple yet effective a black and white panda bear looks in a monochromatic grey interior. Finally, greens don’t have to always be live. Sometimes they are more effective when they’re painted. 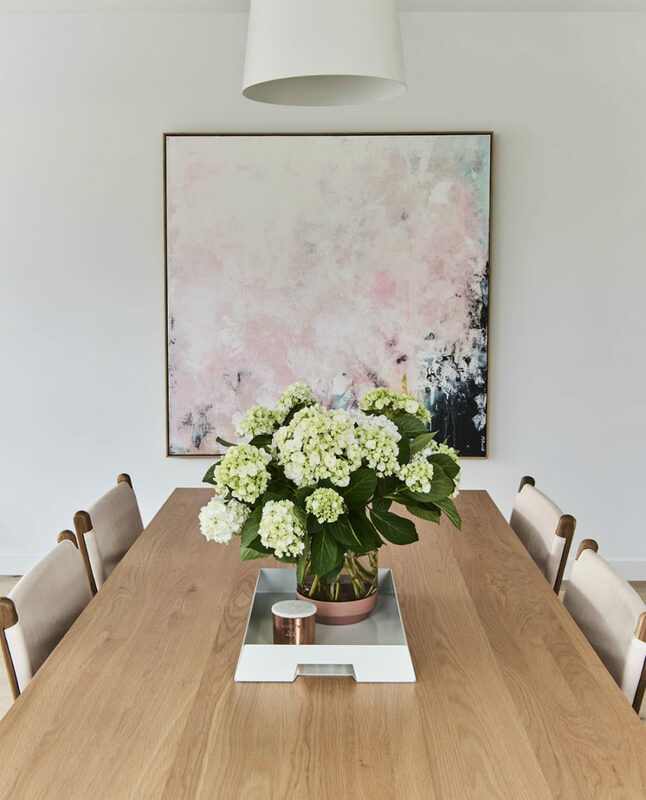 And this Jenny Bernheim dining room proves it. There is a lot going on in contemporary art. Any object can become a subject. And you don’t need a reason to use it in your decor. As long as it attracts attention, it can work. 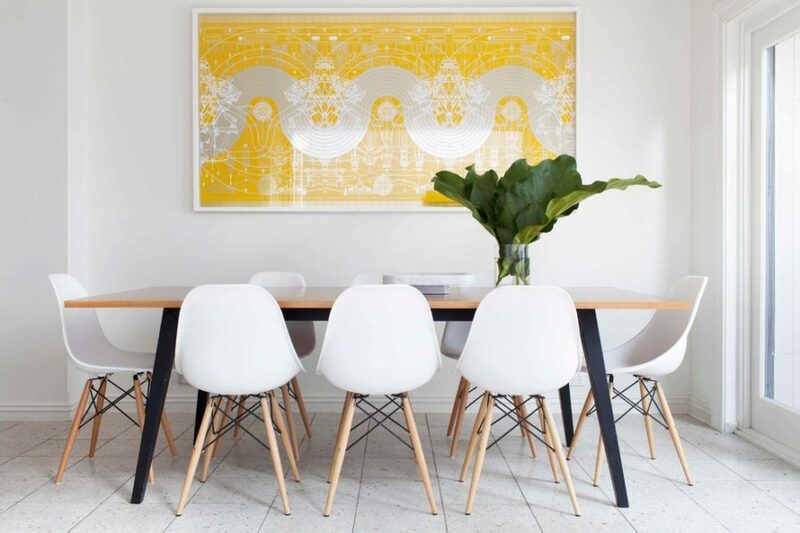 A white dining room will always be a blank canvas for any artwork, modern or traditional, bright or neutral. You can use it specifically to punctuate a chosen painting, print, or mural. The bigger the scale, the less additional decorating you’ll need. 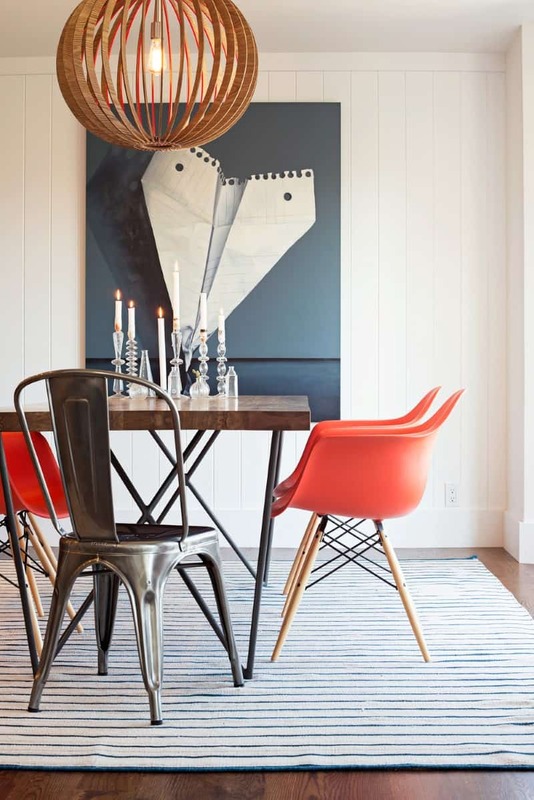 Coordinating the colors of your chosen artwork and the rest of your dining decor is important. But the colors of one don’t necessarily have to correspond with those of the other. Contrast is king. As long as there is no clash, difference in colors will look interesting and exciting, although better to add just a few decor accents that tie everything neatly together. 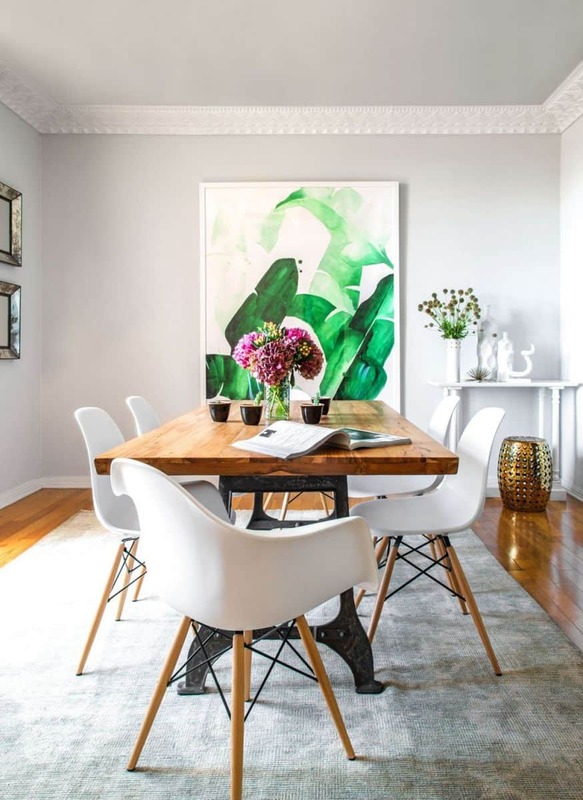 Dining rooms featuring artworks of standard sizes aren’t as exciting as those that have oversized canvases. There is something grand about them, and you can definitely use that to maximize the impression. The subjects of such works don’t have to be as grand, though. You want an element of decor, not a history painted on walls. Or do you? Finally, a single artwork may consist of a few parts. It’s been a trend for some time, but now it’s as fitting as ever. You may choose to hang them as separate pieces or as an assembled puzzle, and again the contents don’t even have to make up a coherent picture. 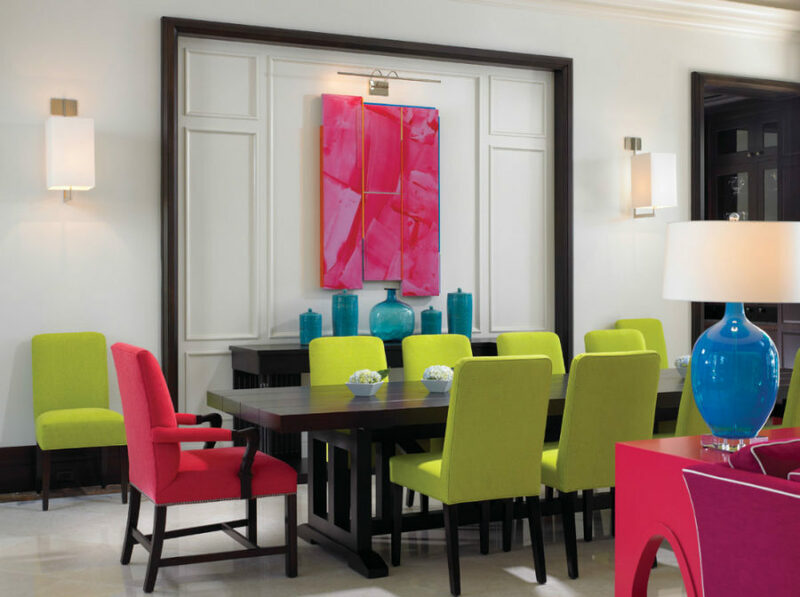 Dining rooms featuring artworks will never fail to look stylized. You may assemble the aforementioned arrangement from an array of flea markets or IKEA, and it will still work just as if you’d piece it together from designer shops.